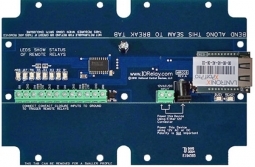 Push Notification Over IP allows you to connect a contact closure to the board and send an email or text message when the circuit is closed. The board will communicate the contact closure information to your computer over your Network. N-Button Software will then send a text or email from the computer to your selected recipients. By selecting the Ethernet interface you will be reading the inputs on the board through your local area network. Boards on this page are equipped with a Lantronix XPort communications module that adds Ethernet communications to the board. The board will plug directly into your router where it is assigned an IP address. N-Button Software will be installed on a computer on the same network, read the input and send the text and/or email when the contact closure is closed. Below you will find the Push Notification Over IP boards. When a contact closure is closed the signal will be sent to a computer over your network on your computer. Once the signal is received software will then send out the email and/or test message that you configure. Choose below how many contact closure inputs you will need on the board.